Trump mentioned Michigan, as well as a host of other swing states, while talking about trade. “I have met the men and women of Michigan, Ohio, Pennsylvania, Indiana, New Hampshire, and many other states whose dreams were shattered by NAFTA. For years, politicians promised them they would negotiate for a better deal. But no one ever tried — until now,” he said. However, Trump’s trade and tariff policies have taken a bite out of manufacturing and agriculture in Michigan and other states and are one reason why automakers like General Motors and Ford are starting to chop jobs, as the Advance has reported. U.S. Sen. Gary Peters (D-Bloomfield Twp. ), who’s up for re-election in 2020, called for bipartisanship on infrastructure, economic policies and immigration. Other Democrats in Michigan weren’t impressed with the speech. They accused Trump of repeating rhetoric he’s used in the past and exacerbating the partisan divide that led to the longest shutdown in U.S. history. “The President must rise to the occasion and lead on these important issues, with not just words but with real action. Unfortunately, the President’s administration has so far been consumed most days by tweets, chaos and manufactured crises, including a recent government shutdown that cost our economy billions of dollars. This is no way to run a corner grocery store, let alone the world’s largest economy,” said U.S. Rep. Dan Kildee (D-Flint). GOP lawmakers in Michigan welcomed Trump’s call for unity. U.S. Rep. Tim Walberg (R-Tipton) praised Trump’s agenda. The Democratic response was given by former Georgia gubernatorial candidate Stacey Abrams, who won praise for delivering a stirring defense of voting rights. 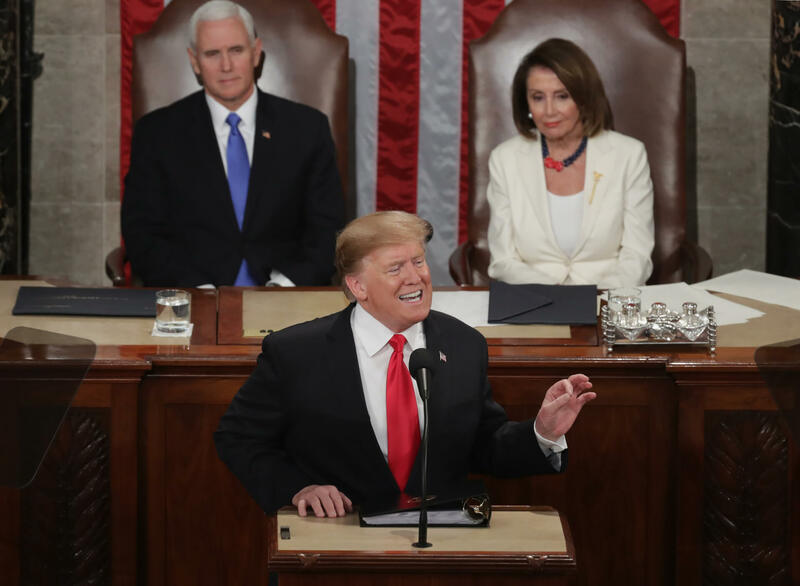 Trump did win raucous bipartisan applause when he mentioned that women were filling the bulk of the country’s newly created jobs last year, as many Democrats did so due to the many women who arrived on Capitol Hill this year. U.S. Rep. Rashida Tlaib (D-Detroit) talked about that part of the speech on MSNBC Tuesday night. “A couple of my colleagues turned around and said, ‘I don’t think he gets it,'” Tlaib said.